Ok, I’ll be frank with you all, this isn’t the most exciting post I have ever put out there. As I was writing it, I kind of yawned a few times and thought to myself, am I really writing about how to keep lettuce and kale fresh, really? I’m writing this post because I want you all to see how easy it is to whip up a nightly salad on the fly without having to buy the pre-washed bagged lettuce or kale. We eat tons of kale and lettuce on a weekly basis and I have found a handy way to keep them fresh longer, while also making it more convenient to just grab a handful of leaves when I want to throw a quick salad together. I’m not claiming to be an expert here, but this technique works for me, so I thought why not share it with you all. This works great for individual lettuce leaves and kale, but not for rolled up lettuces, such as iceberg lettuce. The key to keeping lettuce fresh is to pre-wash, dry and store your lettuce. I always try to wash my lettuce and kale the same day that I purchase it. I just make sure when I’m unpacking groceries to throw the lettuce on the kitchen counter, so I don’t forget to wash it. Ok, lets just get started, shall we? First off, you need to wash your lettuce. You can wash up your lettuce leaves whatever way suits you. I usually fill a large bowl with some cold water and swirl the leaves around to get rid of the excess dirt. You can also fill your sink with cold water, but I’m not a fan of doing that because even though I keep my sink clean, I don’t want to be washing fresh produce in there. I mean we wash our dirty hands in there, rinse raw meat, you get my point. Anyway, drain the water and then give each lettuce leaf a quick rinse under the tap to get rid of any remaining dirt. I sometimes get lazy and just rinse my leaves one-by-one under the tap and call it a day. Ok, next you will need a salad spinner. I honestly think I use my salad spinner every day, so if you like salad, I would highly recommend purchasing one. Put the rinsed lettuce into a salad spinner. Make sure not to crowd the spinner too much or the lettuce won’t dry. Give the spinner a whirl, and spin the lettuce until its dry. 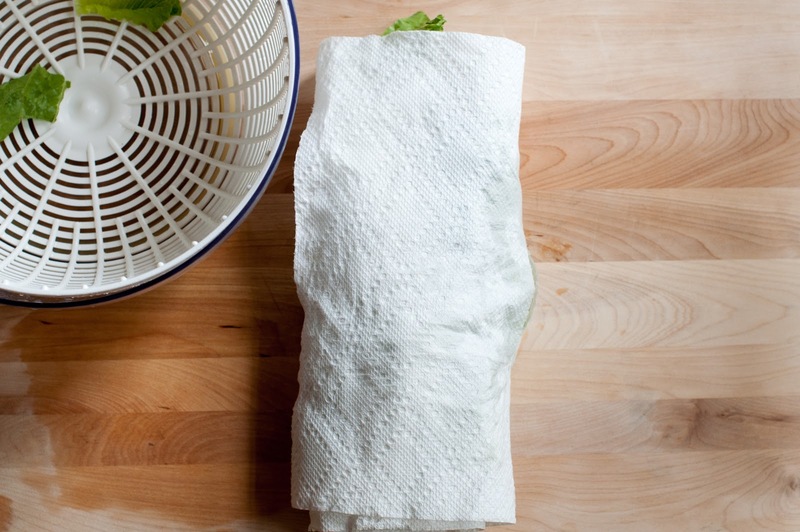 Spread two paper towels (still connected) on your counter and pile the dry lettuce/kale leaves on one end. Wrap the paper towel around the lettuce and then add some more leaves and continue the process until all the lettuce is wrapped up. Make sure to wrap the leaves up tightly. I thought I would show you a picture of the de-stemmed kale before it gets wrapped up. Rolling up the lettuce is almost like rolling up a sleeping bag. Slide the rolls into a gallon sized Ziploc bag. Squeeze the air out and close the bag. Now, you can have fresh de-stemmed kale or lettuce at a moments notice. Just take out what you need whenever you want to make a salad and then just reseal the bag. The plastic bags can also be reused. I let them air out in between uses so that they stay dry. I also make sure to compost the paper towels. 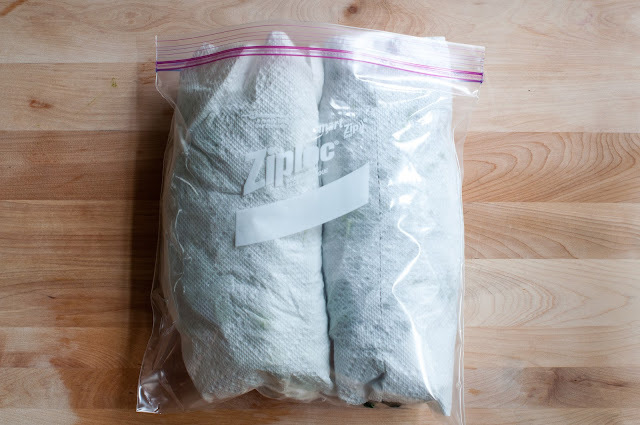 I also did a post on how to keep herbs fresh. Check it out if you want. It has helped my cilantro last 2 weeks. Now that you have some freshly washed greens, you can make some amazing salads on the fly. Here are some links to my favorite kale salads. Kale salad with Brussels sprouts and toasted almonds. Kale salad with ricotta salata. Kale salad with delicata squash, almonds and aged cheddar. Miso kale salad with miso roasted tofu. Stay tuned for Thursday as I’m going to post my kid friendly caesar salad. The dressing is mayo, egg and anchovy free! Now that you have fresh ready-to-go lettuce, it will be a cinch to whip up. I also love these two kale recipes. Pasta with kale, lemon and toasted walnuts. Wheat berries with charred onions and kale. My mom showed me this technique for greens storage, probably close to 25 years ago and it was for lettuce because in rural Michigan, that is about all you could get in a 1991 grocery store in a small town. 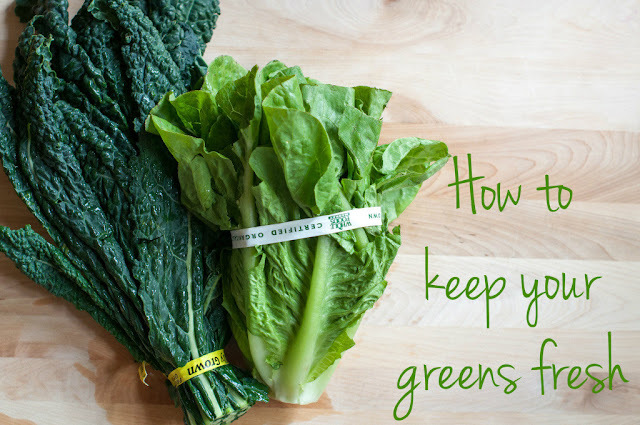 It’s a tried and true method to keep your greens fresh for 5 to 7 days. However, I never have used a Ziplock, but instead, use a recycled plastic grocery bag and wrap loosely. thanks for all the recipes…. Seems great minds think alike. Thanks for the helpful post! Plus, the how-to video and recipes. I love kale salads so am going to try the one featured in the video and the one with Brussels sprouts and toasted almonds. They sound delicious. I just bought an Oxo Greensaver bin so am eager to see how that works out. I think it’ll be a big improvement over leaving my greens in the plastic bag from the store. I have found that white paper towels tend to bleach the color of my greens, so I’ve used natural brown coffee filters instead. I haven’t stored lettuce or spinach this way, but since moving to a different house and refrigerator some months ago they haven’t been keeping as long, so I’ll try this method. Do you seal up the plastic bag? That should help keep them fresh! I also put the greens in my produce drawer in the fridge. thank you so much for this post! I was googling where to store greens in your fridge and came across this! I only have one drawer in my fridge, so mixing the fruits and veggies doesn’t always work and my kale will literally wilt in 2 days, or freeze if its not in the right spot in my fridge…ive wasted so much money! I am trying this method out right away! Also I thought this recent post on “using the right type of kale for the right recipe” might be up your alley. I bought 2 huge bunches of kale today and prepared it for the first time. We tried your lacinato kale salad for dinner and I think I used too much dressing for the amount of kale – it was a bit intense. I am trying this storage method with some fresh spinach – it doesn’t usually last very long and I end up throwing out every other leaf. So I’m hoping it lasts a few more days so I can put it on my quinoa and black bean wraps for lunch this week. Thanks for your tips and great recipes! Thanks,so tired of dry,unappetizing greens. Will try. I read a post from a nutri-bullet blog that she puts her individual servings in small tubs of water to keep fresh.have you heard of this? Another one pre pulses her greens and then freezes in ice cube trays. Do you think freezing causes loss of nutrients ? I am going to try your suggestion..been doing that but w/out paper towel. Thanks! Great post – thanks. In addition to a “time-saver” – when you’re putting together a quick salad, this is also a money saver. We buy organic whenever possible – as well as harvest a lot of kale and lettuce from the garden. In either case, it’s like “gold” and anything that prolongs the “shelf-life” is great. I’m wondering though, if cutting the stems off of the kale shortens the storage time or quality? Do you ever chop the kale and then store it that way so you can throw it straight into the pan? I just wanted to share that I use my salad spinner to clean my greens. I pick them from my garden so you can imagine the bugs/dirt. Put the greens in the salad spinner and fill with water. Swirl them a bit with your hand. Let sit for about 5 minutes. All the gook will settle in the bottom. Lift the inner strain piece with the greens in it out of the bottom plastic bowl. Dump the water from the bowl. Then put the strain piece back in and do the spin. Thank so much for the tip on how to keep them fresh. Thank you so much for the post. I had no clue how to wash kale. it is the first time I am buying it. We want to try kale chips to replace potato chips. I do have a question, when I wash lettuce I always soak it in a bowl with water/vinegar mix. You did not mention vinegar. Is it not necessary? Hi Lea! I never use vinegar when I wash my kale or greens, I just rinse them in water. What does the vinegar do? The vinegar kills all the bugs that might be lurking there. That’s how I learned to do it from my mom. We always had bugs in the lettuce and even though we washed it we might have missed some. So the vinegar made sure it’s still ok to eat. I am new to caring for tortoises and there kale supply gets rubbery, tough and limp before they are half way through it. I am glad I found this and I’m going to try your advice, thank you so much. Is it less wrong to buy the prewashed bagged greens? Thanks, Jackie! I’m new to kale so I will have to try it fresh to see the difference. You have just given a massage therapist a new client! The de-stemming eliminates the stiff bitterness that I didn’t like and the simple lemon and garlic dressing is perfect. You have converted another kale lover. Thank you so much for having such a wonderful website. Hello! And thank you for your lovely and helpful post. I will definitely try it because my sad looking kale is too far gone by now 🙁 However, the stems are my favorite part of kale though I admittedly don’t eat kale raw. I just bought kale for the first time last night for smoothies, and was trying to figure out a way to keep them. This is such a good idea, and very convenient. Thanks! What is your recipe for kale smoothie and the kale salad. This is all new for me and I hope to like it. Thank you for the wonderful tip!! I have a question…if I don’t feel like wrapping it in paper towel in ziplock, do you think putting lettuce in glass container with paper towel would work the same? While this might not have been the most exciting post to write, it was immensely helpful to those of us who are new to the produce section and don’t know what to do with all this green leafy weirdness. Thanks! Do you recycle the zip lock bags? Hi Eddie! Yes I do, I reuse the same bags. If they get too much moisture inside, then I turn them inside out and let them air dry. Well, you may think this was a boring post but I Googled ‘how to store kale’ and it brought me here, so thank you for the tip! I’m so tired of my kale getting wilty before I can use it and I’m hoping this will help, even though I don’t have a salad spinner. How much longer would you say this keeps it fresh? Hi there! Honestly, it really keeps the lettuce fresher longer than just storing it as is from the grocery store, I would say the lettuce and kale lasts a week to possibly two weeks. The best part is you have lettuce ready to go at a moments notice. It’s so nice and convenient not to have to wash up kale or lettuce each time I want to make a salad. Based on research from ‘Eating on the Wild Side’, if you tear the leaves as well, you will double or quadruple the nutrients as the leaves will try to ‘repair’ themselves, and secrete more antioxidants. Sure, store then the same as the kale! Thanks for your kind words. ok…if your cilantro lasts two weeks…you are onto something! This works….and I’ll do it every time! Ok I just made kale and lettuce burritos for my crisper!!! You go girl! It is like rolling up burritos. We should be good at that from working burrito day the past 5 years. Love these posts, they’re so atmospheric. Jackie you are the kitchen rock star!!!! You rock as well Baker mama! Ok, then you will be my bread and dessert baker! Sound good? Here, here! I agree! I’ve only ever had kale one way: Spray it with Pam (or drizzle with olive oil), barely sprinkle with salt (goes a LONG ways), bake for about 7 minutes @ 350 degrees, until the leaves get crispy but not burnt. Makes the most yummy, sinful snack — you’ll be sure you’re making yourself fat with this, and yet it is DELICIOUS. My daughter (15) took this from the broiler idea, but it was too hard to control, so she tried experimenting in the kitchen. Now we eat it every day!